Je suis tellement ravie et tellement excitée de participer au fabuleux et célèbre 25 Tags of Christmas de Tracey McNeely en tant que membre de l’équipe de Design d’Uniko. Chaque année, depuis déjà 7 ans, nous pouvons admirer et être éblouis par toutes les superbes étiquettes présentées par d’autres créateurs talentueux. On y trouve tellement d’inspiration ! Cette année, avec d’autres entreprises artisanales, Uniko parraine à nouveau cet événement. Heureusement, Bev (Uniko) a récemment sorti quelques produits magnifiques si bien que j’ai pu les utiliser sur mes tags (étiquettes) et je les ai même mélangés avec des produits plus anciens. 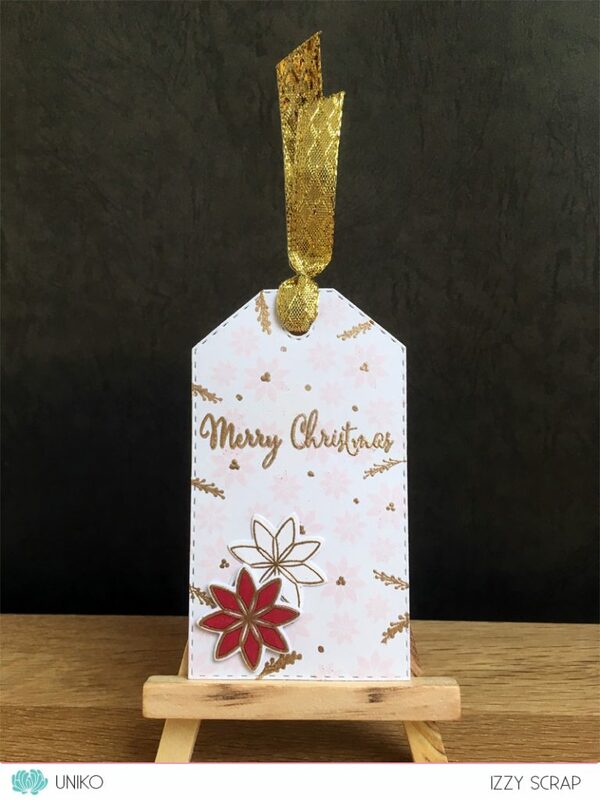 I’m so delighted and so exited to taking part in Tracey McNeely’s fabulous and famous 25 Tags of Christmas event as a member of the Uniko DT. Every year, since already 7 years, we can admire and be swoon by all the stunning tags displayed by other talented crafters. So many inspiration can be found ! 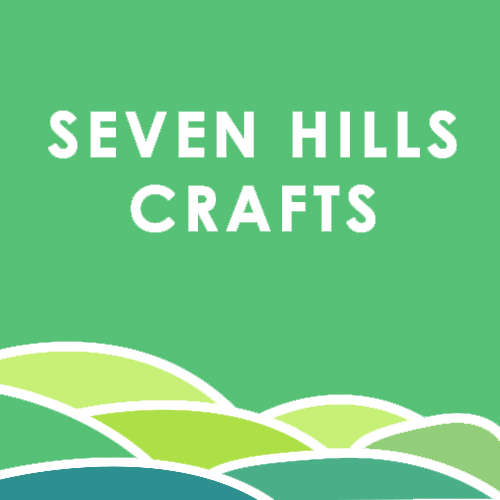 This year, along with other craft companies, Uniko is sponsoring again this event. Luckily, Bev (Uniko) recently released some gorgeous products so that I could use them on my tags and I even mixed them with older products. Ce premier tag est fait avec un reste de la technique “effet marbre” avec de la mousse à raser que j’avais utilisé pour cette carte. J’ai pensé qu’il serait parfait pour faire un joli support pour mettre en valeur le tampon “Background Blocks : Falling Snow” et la matrice de flocon “Snowflake Trio”, dernièrement sortie et que j’adore ! Le sentiment provient du set “Background Builders : Christmas”. This first tag is made with a scrap of the “marble effect” technique with shaving foam that I used for this card. I thought it would be perfect to make a nice background to highlight the “Background Blocks: Falling Snow” stamp and the “Snowflake Trio” die, recently released and that I love so much ! The sentiment comes from the set “Background Builders: Christmas”. Pour le second tag j’ai utilisé un ancien set de tampons “Flower Power #1” avec les matrices assorties dernièrement sorties “Flower Power #1 – #6 collection”. Les petites touches en doré sont faites avec des éléments des sets “Background Builders : Vines Winter”, “Rustic Wreath” et le sentiment vient du set “Rustic Christmas”. For the second tag, I used an old set of stamps “Flower Power #1” with the matching dies recently released “Flower Power #1 – #6 collection”. The tiny touch of gold are made with some elements of the sets “Background Builders : Vines Winter”, “Rustic Wreath” and the sentiment comes from the set “Rustic Christmas”. Enfin, le dernier tag est fait avec deux sets sortis en Septembre et en Octobre : “Background Blocks : Scattered Polka Dots” et “Block Party Christmas”. Le sentiment vient du set “Pure Florals : Poinsettia”. 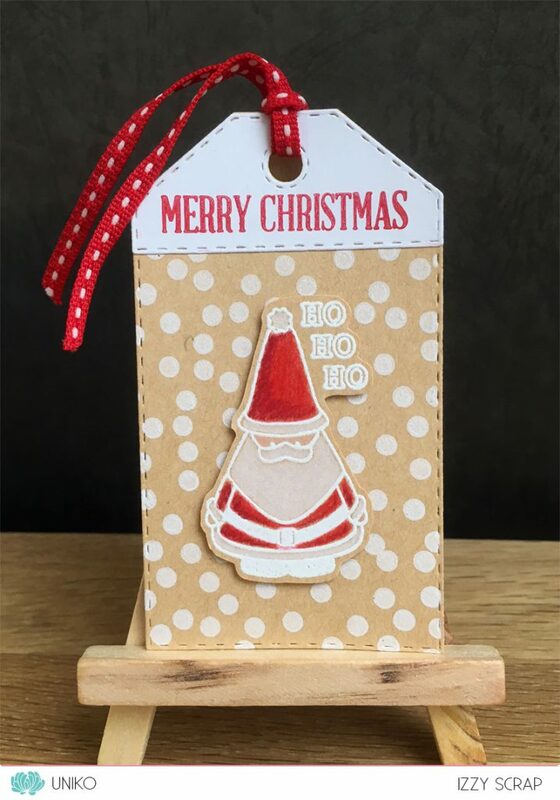 Finally, the last tag is made with two sets released in September and October: “Background Blocks: Scattered Polka Dots” and “Block Party Christmas”. The sentiment comes from the set “Pure Florals: Poinsettia”. 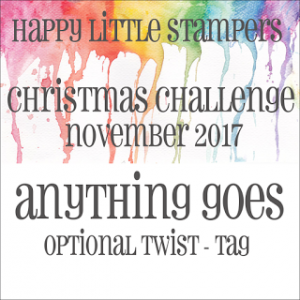 Honoured and Happy to be one of the favourite at the Happy Little Stampers Christmas Challenge ! Voilà pour moi ! Merci Bev et Tracey, j’ai été ravie de participer à cet évènement ! J’espère que ces tags vous inspireront. Vous trouverez encore plus d’inspiration sur le blog d’Uniko ICI où mes équipières partagent aussi de petites merveilles ! 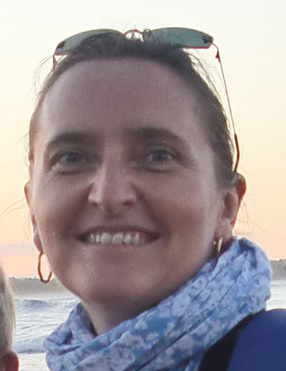 Et si vous aussi vous avez envie de jouer à l’événement de Tracey, cliquez ICI pour toutes les informations sur l’événement et pour le lien. And Voilà for me ! Thank you so much Bev and Tracey, I’ve been delighted to play along ! I hope that these tags will inspire you. You will find even more inspiration on the Uniko main blog HERE where my dear teamies also share some little wonders ! And if you also fancy playing along at Tracey’s event, click HERE for further information on the event and for the link up. Your tags are great. I love the one with the snowflake. 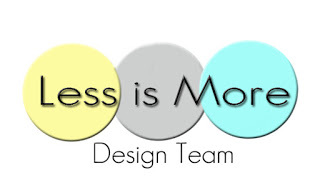 Thanks for playing with us at HLS Mixed Media Challenge. Izzy, these are all wonderful. I especially love the one with the marbeling effect. 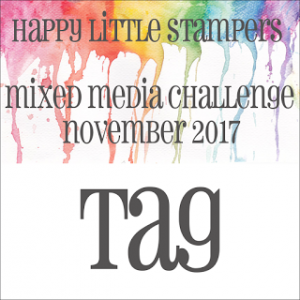 Thanks so much for linking up and playing with us at Happy Little Stampers November Christmas Challenge. I wanted to stop by again today to let you know that I posted a tag today (on my blog) that was completely inspired by your teal tag above. 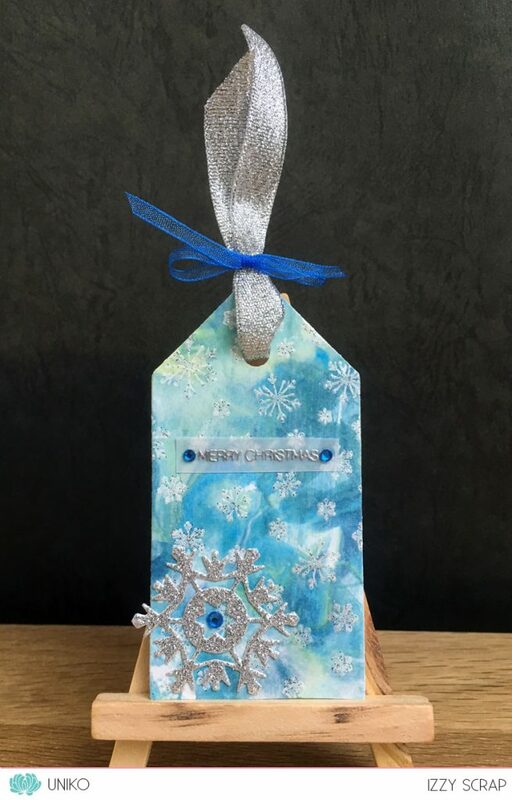 I loved the teal blue with the silver snowflakes and silver ribbon, and really wanted to create something with that same vibe and inspiration. I hope you will stop by to see the tag YOU inspired me to create. 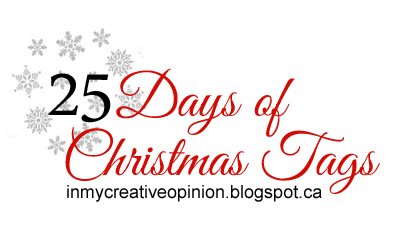 Thanks once again so very much for sharing your talents in the 25 Days of Christmas Tags. It was such a blessing to me. Lovely tags! 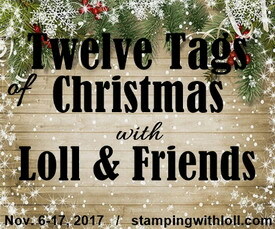 Thanks for playing with us at Happy Little Stampers! 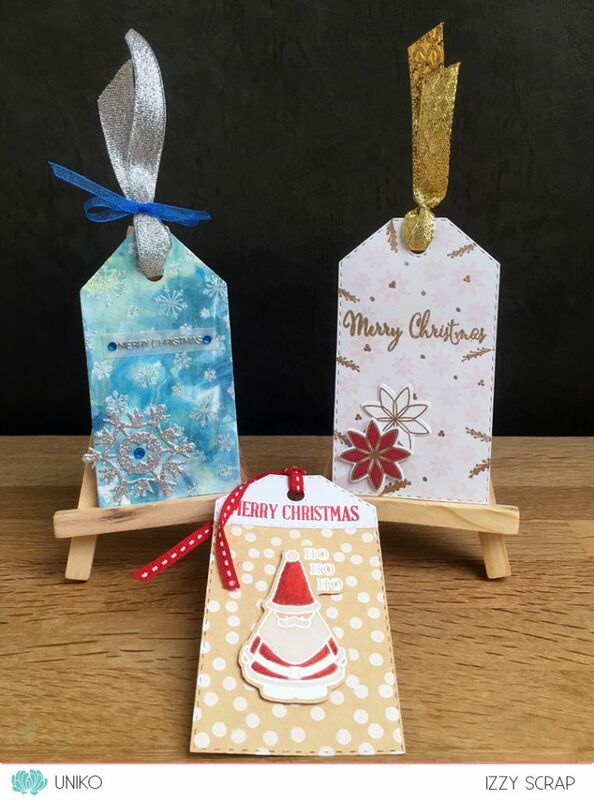 This is the perfect little set of Christmas tags !! Gorgeous tags Izzy and so cas. All beautiful in their own right. Thanks for sharing with us over at HLS for our November Christmas Challenge. C’est super Izzy de pouvoir participer à ce joli challenge en tant que membre. Tu commences fort avec ces trois premiers tags ! De superbes créations toujours accompagnées de ces techniques que tu manies avec art. Wow! I’m totally in love for your stunning set of tags!!! Fabulous tags Izzy, well done. Thanks for sharing your PRETTY tags! Beautiful tags Izzy!! Especially love the marble background with embossed snowflakes. So pretty and sparkly! Thanks for joining my tag event! Super cute tags – love the sparkle and the colors. chubby Santa on the last. A trio of delight, Izzy! You have the most innovative ideas when it comes to Uniko products! Your Santa…absolutely smitten with him!